Burnham welcomed Basildon for our second fixture. Basildon had a scratch team of coaches without their main coach but they had some strong runners within their team. However Burnhams defence was a testament to their previous years coachies (Hazel) whom has set them in good stead. Although Burnham scored many tries it was the defensive tagging display to stop Basildon from scoring that won them the day. There were two games played of 5 a side and 10 minutes each half. Although the scores are not registered Burnham won both games 12-8 and 15-5 respectively. 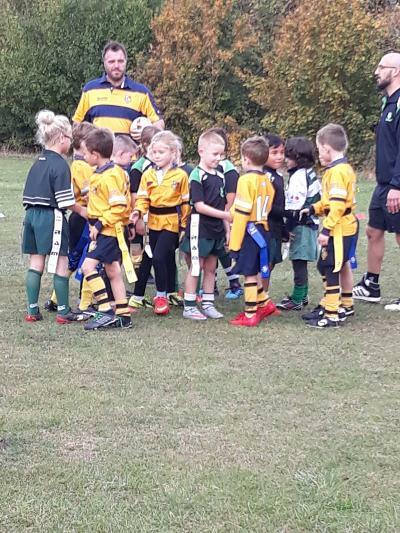 Both games were played in good spirit with both teams showing good TREDS with some of the burnham players making sure that the TAGS were returned even when they had fallen off of a player. Casey was player of the week which was also voted for by most of the team. He was a player on a mission with not only Tagging but also running in many tries this week. Jake gave him a good run for POW but again every player played their part and worked well as a team.